The navigation of the Winnipeg River by boat or canoe is one of the most difficult in the world. In its course to Lake Winnipeg it falls many hundreds of feet  by a succession of cataracts, most of which are of a very difficult and dangerous character. The portages on the route enabled the force to pass a number of these places, but many rapids had to be run and many risks taken before we arrived at Lake Winnipeg. On approaching a rapid which has to be run, the bowman always stands high in his place and steers, long paddle in hand, braced against the stem, his keen and practiced eye on the rushing water. The voyageur in the stern, who has shipped a long oar in the stern rowlock, a ring securely fashioned so that it cannot jump out, keeps the boat from swinging in the current. Down the torrent the craft rushes, propelled by the desperate efforts of six oarsmen. They row as for their lives so that there may be steerage way for the bowman who, by skilful use of his paddle, brings the vessel safely through the rocks and whirlpools of the passage. The boat seems to spring beneath its crew, the speed being so great that the oars seem like feathers in their hands, no pressure of the water being felt on the blades as the boat careens down the incline. At a very early hour the next morning we were at work and had our boats and their cargoes across before breakfast. The ground was rough and stony but level, and on this portage we saw the heaviest load carried. One of the Company's guides, a tall, dark and powerful looking voyageur, with a full black beard and mustache, hearing of the exploits of the Iroquois and others in our brigade, was anxious to show what he could do, so he carried two barrels of pork and 100 rounds of ammunition across. The load had to be carefully secured and placed so that he could stand well under it. The weight was 528 lbs., but the burden was an awkward one and nothing to be gained by it except to show the man's great strength, which was patent to everyone as he moved quickly under the load without any apparent distress. Many heavy burdens were carried by the officers and men; nearly every boat had several who carried their barrel of pork or arm-chest of 200 lbs. without any difficulty. Many conveyed a barrel of pork and a sack of beans on their backs as one load. I always carried my share of pork with either my knapsack or another pack, of equal weight added. One of the officers of the 60th [Imperial Rifles], Ensign St. Maur, [later to be Duke of Somerset], a tall, handsome young man, nicknamed "Anak," because of his great strength, frequently packed two barrels of pork on his back, 400 lbs., and Captain Redvers Buller, [later to become Major-General Sir Redvers Buller], always took at least 200 lbs. and sometimes 300 lbs. a trip. Everyone of us, on account of the training given by the heavy work, became much stronger than when we started, even though he was then in good condition. Winnipeg River and Lake of the Woods (Clear Water L.) showing Grand Discharge (Le Grande Decharge) 1876. At the rapids called Le Grande Decharge  we met with what at one time promised to be a serious mishap. Big Mike, the powerful and skilful Iroquois, although of Major Macleod's boat, took the bow of ours also, and Captain McMillan, who had remained at the summit to see his boats safely through, came in our craft, which was the last, and sat in the stern sheets near Big Neil McArthur. I had the stroke oar (we took turns at it) and, as we approached the crest, set the pace, but just as we passed over it, rowing our best, Neil's oar snapped like a pipe stem and the boat swung into the tremendous waves on our right, rolling and pitching over them, and hurling several of the crew from their oars into the bottom of the boat. Captain McMillan tried to hold my oar down in the rowlock to enable me to row, but it was impossible: we were quite helpless, and death stared us in the face as we surged past the rocks and whirlpools at a great speed, while Big Mike stood towering in the bow wielding a heavy oar as if it were a light paddle. His long hair streamed in the wind, his coal black eyes glared at the angry waters, and he handled his oar with such effect that the boat came safely through, landing us far below, and his compatriots on both sides of the Decharge, who, with our comrades of the brigade, were watching the outcome with great anxiety, joined him in wild whoops and shrieks of triumphant laughter. At Fort Alexander, which we reached at sundown on the 25th [August] we found Mr. Donald Smith with news of the Red River Settlement. Colonel Wolseley and his staff had arrived on the 20th ... We were off early on the morning of the 27th, and the next day we ploughed our way up Red River, numbers of the Scotch settlers and Indians came to the bank to welcome us to the "Great Lone Land" and the church bells rang merrily as we passed. The brigades arrived at Lower Fort Garry early in the afternoon ... We left here early next morning and tracked up St. Andrew's rapids. Numbers of people came, as on the previous day, to welcome us as we rowed along. We arrived at [Upper] Fort Garry at sunset on August 29 ... and encamped on the level grassy plain between the mouth of the Assiniboine and the fort. 1. Colonel Samuel Benfield Steele, C.B., M.V.O., served as a private in the 1st (Ontario) Battalion of Riflemen, Red River Expeditionary Force (1870). Prior to being offered a "place" in Colonel Garnet Wolseley's force, he had held a commission in the 35th Regiment; had organized and trained the Clarksburg Company, 31st Grey Regiment, and held a field officer's certificate in both cavalry and infantry from the Toronto Military School. He resigned his commission upon entering business in 1869. In July 1870 he was posted to No. 4 Company, 1st (Ontario) Battalion of Riflemen, under command of Captain Daniel Hunter McMillan, later to become the first senior Major, 90th Winnipeg Battalion of Rifles; Commanding Officer, 91st Winnipeg Battalion of Infantry; and Lieutenant-Governor of Manitoba. The company subalterns were Lieutenant William Nassau Kennedy, later to become second Mayor of Winnipeg; first commanding officer, 90th Winnipeg Battalion of Rifles, Officer Commanding, Canadian Voyageurs, Nile Campaign; and Ensign Stewart Mulvey, later to command Mulvey's Volunteer Company during the Fenian Raid into Manitoba (1871); founder, editor and publisher of The Liberal newspaper (1871); Collector of Internal Revenue (1873); school trustee and alderman for many years; member Manitoba Provincial Board of Education; elected Member of the Manitoba Legislature for Morris (1896). Samuel Benfield Steele went on to command the North West Mounted Police on the line of construction C.P.R. 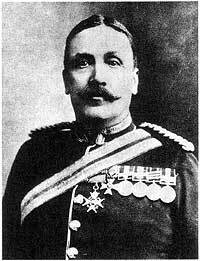 He raised and commanded Steele's Scouts during the North West Rebellion; commanded the North West Mounted Police detachments in the Yukon and British Columbia; served on the Yukon Territory Council (1898-1899); raised the Lord Strathcona Horse for service in the South African War; commanded the Royal South African Constabulary; served as General Officer Commanding Military District No. 13, Calgary and Military District No. 10, Winnipeg. Early in 1915 he took command of the 2nd Division, Canadian Expeditionary Force; becoming later in the same year camp commandant, Imperial troops, Shorncliff. a post he held until the end of World War 1. Commenting on his decision to serve as a private in the Red River Expeditionary Force, he said: "We were already well drilled, but as yet, the N.C.O. 's were only "acting." and as it was necessary that all should have officer's certificates, the order came out one afternoon for all men with Military School certificates to fall out on the right, but I did not do so, as I had made up my mind to serve as a private. The men were kind and cheerful companions, always ready to do a good turn for a comrade, so that as far as experience went I was better off without chevrons and learned how to appreciate the trials of other men to an extent that I should never have been able to do had I been promoted." The somewhat confusing reference in the foregoing paragraph to the N.C.O. 's being required to hold officer's certificates may be put aright as follows: In 1870 when the 1st (Ontario) Battalion of Riflemen and the 2nd (Quebec) Battalion of Riflemen were being mobilized for service at Red River there were 4,000 men enrolled in Active Militia units and 95,000 in what was called the "Sedentary" Militia. However, only 54 officers and 796 other ranks were authorized for service at Red River. In the face of an overwhelming response to enlistment, rigid quotas sere established for each active militia unit. Thus, almost all the officers took a reduction in rank in order to go on active service, and many ensigns (the lowest commissioned rank in 1870, changed to second-lieutenant in 1871) reverted to the ranks and signed on as privates. Hence, the above reference is to ensigns (with officer's certificates) being asked to fall out, declare their status, and serve as non-commissioned officers. 2. The fur traders route through the tangled labyrinth of Winnipeg River was approximately 150 miles, and throughout this distance the average drop was slightly more than two feet per mile. 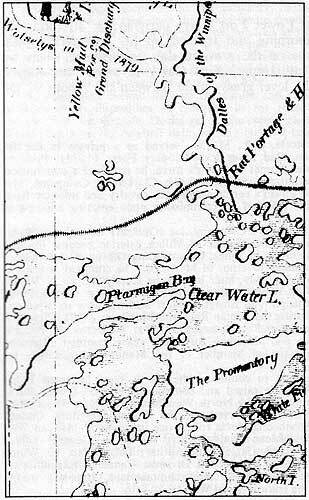 It was a treacherous and tumultuous stream, and before hydro dams had converted many falls and rapids into quiet lakes and bays, there were thirty portages according to one authority; thirty-six according to another, the total number of portages over the whole route from Montreal to Red River being ninety by the former chronicler and one hundred and twenty by the latter. On either reckoning Winnipeg River was "a white-water hell." 3. If the hydrographers' normal summer levels for Lake of the Woods and Lake Winnipeg are taken as the norm for determining the descent of the Winnipeg River between the two lakes, then the drop is 347 feet. 4. In comparing current data on the nature and character of Winnipeg River with accounts of its disposition as recorded in fur trade journals, it is reasonable to assume that Le Grande Decharge is the open channel below Minaki near the White Dog dam, the original twin (south) channel being blocked off by the rock-fill of the forebay.